What are the Returns a service tax assessee has to file? ST-3 Return - For all the registered assessee, including Input Service Distributors, (Ref. Section 70 of Finance Act,1994 and Rule 7 of Service Tax Rules, 1994 read with Notfn.No. 14/2007-ST dated 02.04.2007). ST-3A Return - The assessee who is making provisional assessment under rule 6(4) of the Service Tax Rules, 1994. 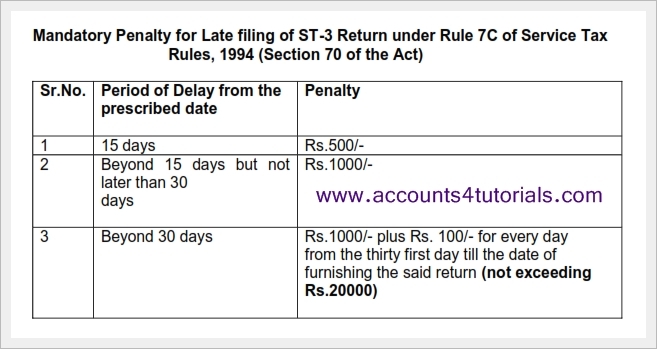 ST-3 Return is required to be filed twice in a financial year - half yearly. The details in respect of each month/ Quarter, as the case may be, of the period for which the return is filed, should be furnished in the Form ST-3, separately. The instructions for filing return are mentioned in the Form itself. It should be accompanied by copies of all the GAR-7 Challans for payment of Service Tax during the relevant period. Is there any provision to file a revised return? Yes, under rule 7B of Service Tax Rules, 1994 an assessee may submit a revised return, in Form ST-3, in triplicate, to correct a mistake or omission, within a period of ninety days from the date of submission of the return under Rule 7. However, where an assessee submits a revised return the relavant date for the purpose of recovery of service tax , if any , under section 73 of the Finance Act, 1994, shall be the date of submission of such revised return. What is e-filing of Service Tax Returns? How to file Service Tax return? With effect from 25th August, 2011 in terms of Notfn. No. 43/2011 all Service Tax returns are to be filed electronically. Is E-filing of Returns mandatory to all assessees? E-filing of Returns is mandatory for all assesses as provided by Rule 7 amended by [Notification No. 43/2011-ST dated 25/08/2011]. What is the procedure for e-filing? Filing of return within the prescribed time limit is compulsory, even if it may be a nil return, failing which penal action is attracted. Whether a single Return is sufficient when an assessee provides more than one service? A single return is sufficient because the ST-3 Return is designed to capture details of each service separately within the same return. Is there any penalty for non-filing or delayed filing of the Returns? I DID NOT FILL MY SERVICE TAX RETURNS TILL THE FIRM IS COMMENCE FROM REGISTRATION OF SERVICE TAX ACT.